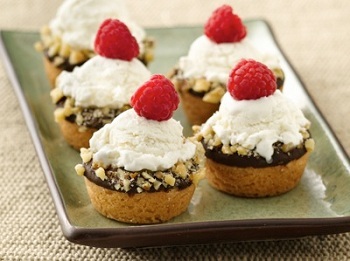 Mini Ice Cream Cookie Cups win the 44th Pillsbury Bake-Off! The 44th Pillsbury Bake-Off ended yesterday morning, with one lucky baker walking away $1,000,000 richer. Last time around, I was lucky enough to attend the big event and spent some time blogging about it, both about the experience of attending and about what goes into making those recipes so great. The cooks there are talented, and don’t let the fact that there are some required ingredients for the contest let you think otherwise! This year, the million-dollar grand prize went to Sue Compton of Delanco, NJ, for her Mini Ice Cream Cookie Cups (pictured above). I love this recipe because it seems so simple, yet when all those flavors come together, it really hits the nail on the head in terms of great flavors. It’s a sugar cookie crust baked in a mini muffin pan, rimmed with chocolate and walnuts, filled with a little bit of jam, then topped off with ice cream and fresh raspberries. This would definitely be easy to throw together for summer parties! Cooking with Amy was at the Bake Off, along with a number of other bloggers. There is also an official Bake-Off Blog. All are worth checking out. The contest is so big that it takes two years to get to the next round, but that is just enough time to experiment in your own kitchen and come up with your own million-dollar recipe! 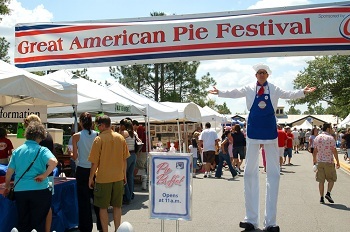 Previous PostPrevious Win Tickets to the Great American Pie Festival! I just learned that my grandmother knows the women who won! Now I’m even more inspired to enter next year.